The native brookies of the Blue Ridge Mountains are colorful and feisty. We strapped our gear to our packs, in preparation for the lengthy descent down an unmarked mountainside in the beautiful Blue Ridge Mountains of Virginia. Sliding and stumbling down the blanket of wet leaves and rocks, we eventually found a slight trickle of water dripping out of the side of the mountain. This was our first indication that we were headed in the right direction in our quest to find Hawksbill Creek. This trickle became bigger, louder, and wider as we continued down the slippery slope. A thousand vertical feet later, we reached a point where we could resist the water no longer. We stepped into our waders and boots, and took a couple celebratory swigs from the bottle of bourbon that should accompany every fisherman. I splashed into the cold, clear water, hesitant to make my first cast. I did not want our hike to be in vain. I eventually laid my size 16 Royal Wulff down gently near a small waterfall, and watched it drift back toward me for a good second before a flash of bright orange demolished the fly. 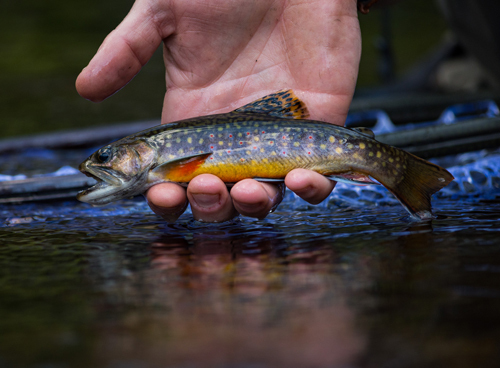 The next three casts all produced Virginia’s beautiful native brook trout, as well. Leg-power gets you into this stream and is required to cover a lot of water. The fish were everywhere, but they made us work for them, often only taking a fly presented in very tight spots. We worked our way up through the pools and continued to pull out fish. As we regained altitude, the scenery of the river began to shift. Canyon-like walls rose on either side. At first, the walls were low enough to climb over, but eventually they towered above us. Climbing up was not an option, and an unnaturally green moss decorated the walls, leading to plunging waterfalls. One such cascade fell into a long, narrow, deep run. “I guarantee there’s a nice fish in there,” I murmured to myself, as I stripped some line off my reel. I stood perched on a boulder overlooking the run and drifted a fly through the pool. Just as my confidence in the run was fading, a large, dark shape shot out from the churning below. 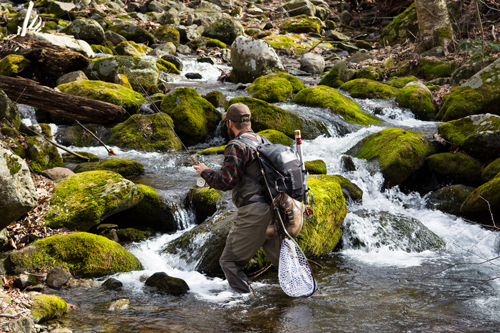 Unfortunately, when I see a fish moving toward my fly, I have a tendency to get excited and set the hook into the air before the fish has a chance to take a look at it. Needless to say, the brookie was unable to follow my fly up into the tree that the fly became tangled in, and thus remained safe from my net. The steep walls along the creek made for dramatic waterfalls and deep pools. So I waited an agonizing minute or two–during which I retrieved my fly–before making another cast. Somehow, my clump of feathers tied to a hook fooled the fish again, and this time, I held steady and waited for the fly to disappear. The rod bent and the fish thrashed. The fish jumped a few times before he shook himself free again. Normally, this is when I slap my rod on the water, but knowing how many of these fish lay in each pool ahead allowed me to shrug it off. We about lost count of the number of brook trout we caught, and after a long hike back up, we were both happy to be sitting in our trucks. We congratulated ourselves on a day well fished, as we rubbed our tired legs and watched the sun sink out of sight behind the mountains we love so much. 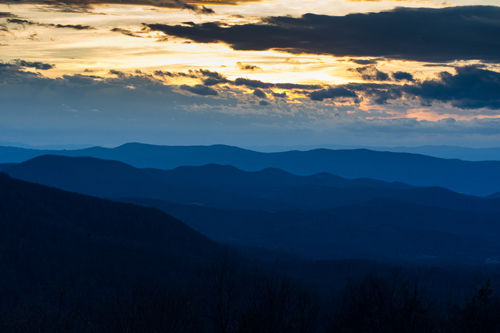 They don’t call them the Blue Ridge for nothin’. Connor Tapscott is a photographer who lives in Richmond, Virginia.